Being a member of SSS not only helps us prepare for our retirement and enjoy health care benefits. For many getting a salary loan can also be a big help in case of financial emergency. The following information and procedures must be observed. 2. You need to be active contributing member for the last 6 months. 3. You need to have at least 36 months contribution to apply for one-month loan or 72 months contribution for 2 months loan and so on. 4. Under 65 years of age. 5. You have not been disqualified before due to fraud against SSS. What are the documents you have to submit? 2. SSS ID or E-6 acknowledgement card + 2 valid IDs with signature and at least one with photo. 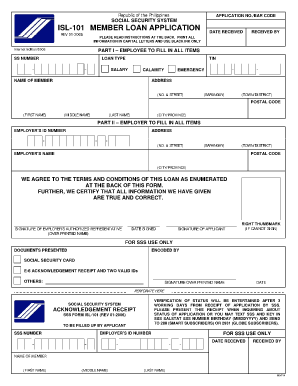 The self-employed voluntary member, non-working spouse, farmer or fishermen, household helper or overseas worker should submit an accomplished SSS Form ISL-101, as well as a digitized SSS ID Card or E-6. Two valid identification cards are also required, with at least one showing your recent photo and birth date. For the valid identification cards, the SSS will accept the TIN or tax identification number card, school or company ID, unexpired driver’s license, PRC or Professional Regulation Commission card, postal ID or passport. Letter of Authority (LOA) signed by both the member-borrower and member-borrower's authorized representative. Make sure that at least one of your IDs have your signature on them. Any SSS main or regional office. SSS Representative Offices in selected countries. Online through My.SSS account. You can register here. The one-month and two-month loans are payable for a period of two years. The annual interest of the salary loan is 10%. The salary loan can be renewed after the prescribed two years. There is a service fee of 1% from the proceeds of the loan and a penalty of 1% interest each month for failure to pay. The first deduction from the salary will be made on the second month after the date of the loan.